This work comprises of ten hundreds - centums or hundred decades, each of which is called a “Tiruvāymoḷi” which means “Inspired utterance” as well as “Divine speech”, the speech from the holy mouth of the Saint Nammāḷvār. Tiruvāymoḷi of Śrī Nammāḷvār is also a part of what is known as Collection of Works of ancient Vaiṣṇavite Āḻvārs or Ancient Saints – usually called Divya Prabandham or also known as Drāviḍa Veda. This collection of Divya Prabandham and Tiruvāymoḷi of Śrī Nammāḷvār as its part – is regarded very high – as a Holy Scriptures – and very significant in religious tradition of Śrī Vaiṣṇavism, Tamil history and South Indian religiosity and Bhakti movement, tradition of love and complete surrender to God in particular. According to the Ācārya Hṛdayam, the Vedas as we know are Śruti, i.e. what was heard or revealed, and anādi i.e., without beginning or authorship. They are the supreme authority. They have a “beginning” ādi from the Āḻvārs only in the sense that the latter were the instruments through which the Supreme Lord Nārāyaṇa, revealed His will. They say that like ‘Śruti' which was given by Lord to Brahmā, Divya Prabandhams were also given by Lord to the Āḻvārs. Āḻvārs started giving equal status to Tamil along with Sanskrit. This devotion to two fundamental sources is known as Ubhaya-Vedanta – or Dual Vedanta. Tiruvāymoḷi of Śrī Nammāḷvār is a skilled poetic composition in which each stanza begins with the closing word of the previous stanza or the phonetic sound thereof. Unlike the other hymns of the ' Divya Prabandham Tiruvāymoḷi is accorded the special status of being chanted only inside the temples or at homes when the Deity is seated for congregational worship, and not when the Deity is taken out in the streets in ceremonial procession. 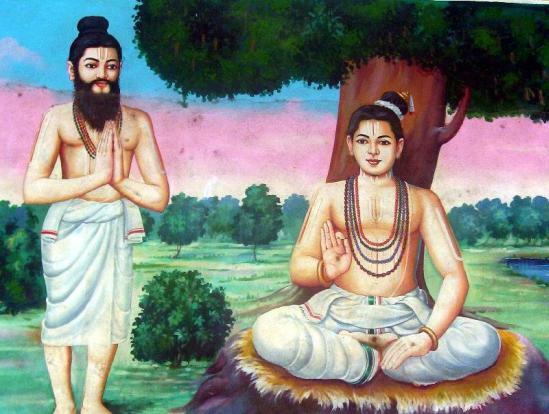 The bhakti movement in South India came to the fore during the 6-9 centuries A.D. This was the period in which many mystic poets, both the Nāyanārs of Śaivism and the Āḻvārs of Śrī Vaiṣṇavism, went about singing the praises of the Lord. They wandered from place to place and composed their hymns in praise of the particular deity in that place. Akam (‘internal ’) is what pertains to the individual and the private, the inner, the introvert. Puram (‘external’) is what pertains to the public man, king or officer, the outer, the extrovert. Love poetry will come under akam and the poetry of heroism or war under puram. The intense devotion which the Nāyanārs and Āḻvārs felt towards God would normally come under akam. The Vaiṣṇavite Āḻvārs went one step further than their contemporary Nāyanārs thinking of this devotion in terms not so much of man and God as of man and his beloved, whether a child (Periyāḻvār) or a lover (Āṇḍāḷ). The human soul longs for God as a woman for his sweetheart. There are inscriptions relating to the reign of Pārantaka I at Lālguḍi and Allūr in the Tiruchirapalli district from which it is seen that provision had been made for singing the “Tiruppadiyam” in Śaivite temples. There are similar references in inscriptions dating right from the time of king Rajaraja Chola (985–1014 CE) times, which prove that provision was made for the chanting of Tiruvāymoḷi by Tiruvāymoḷi Tēvar in Vaiṣṇava temples. Not only the hymns, Tiruvāymoḷi of Nammāḷvār but the hymns of other Āḻvārs also were chanted in the temples on particular occasions. It is an interesting coincidence of the bhakti movement in South India that the codifications of the Śaivite hymns by Nambiyandar Nambi and of the Śrī Vaiṣṇava hymns, Divya Prabandhams, by Nāthamuni were gathered more or less about the same period and in the same region. Nāthamuni’s period must have been around the end of the ninth and the beginning of the tenth centuries. As per the traditional account Nāthamuni once heard some visitors to his place from Kurukūr, the birth place of Nammāḷvār, recite a hymn of ten verses from Tiruvāymoḷi. He was enchanted by the melody of the hymn. Realising that they were only part of a thousand verses composed by Nammāḷvār, Nāthamuni travelled to Kurukūr in the hope of discovering the remaining verses. At Kurukūr Nāthamuni worshipped Lord Viṣṇu and then repaired to the foot of the tamarind tree under which Nammāḷvār had spent his time, in the hope of having the Darśan of Nammāḷvār. He was disappointed however. Then he started reciting Madhura Kavi’s ten stanzas in praise of his guru Nammāḷvār. When he recited those stanzas 12,000 times, both Nammāḷvār and Madhura Kavi appeared before him and imparted to him the knowledge of the four works of Nammāḷvār. Thereafter Nāthamuni stayed on in Kurukūr, meditating upon the Prabandhas, till he was summoned to his native place Vīra-Nārāyaṇa-puram by the deity of that place. And in his native place he and his disciples spent their time chanting the hymns. Apart from tradition, it is now accepted that it was Nāthamuni who codified the hymns, Divya prabandhams, of the Āḻvārs, as mentioned in the Guru-Paramparā prabhavam. Guru Paramparā records that as part of his temple reforms Rāmānuja included the chanting of hymns of the Divya Prabandham. The author of Ācārya Hṛdayam has recorded that Rāmānuja used to explain the Brahma-sutras with the aid of Tiruvāymoḷi. That the Divya Prabandhas had been accepted by Śrī Vaiṣṇavas as equivalent to the Sanskrit Vedas as part of regular temple worship is evident from the reference to Nammāḷvār in the Stotras of some of the direct disciples of Rāmānuja, like Kureśa and his son, Parāśara Bhaṭṭar. Though Nāthamuni and Ālavandār were instrumental in introducing the chanting of the Divya Prabandham in Vaiṣṇava temples, it was Rāmānuja who systematised it and arranged for the chanting of hymns as an integral part of the temple ritual. This is concluded from the inscriptions relating to the post-Rāmānuja period. This is also known from the recorded documents on the Śrīraṅgam temple routine from the time of Rāmānuja. Further, the influence of Rāmānuja can also be seen in the singing of the hymns of Āḻvārs in marriage ceremonies and in obsequies. Śrī Nammāḷvār was born at Tirukkurukūr, also known as Āḻvār Tirunakari, in the Vēlālar Community of fourth Varṇa. His parents were Kāri and Uṭaiya Naṅkai. He was given the name, Māṟaṉ by his parents. It is said that as soon as he was born, he was so absorbed in the contemplation of God that he would not eat or drink but soon took up residence under, a tamarind tree and remained there. He radiated saintly effulgence which could be seen from far and wide. In fact, Matura Kavi who was on tour in the North saw it and hastened to the South, following the direction of the effulgence. He reached the city of the Āḻvār and located the Tamarind tree under which Nammāḷvār was seated. There the meeting took place between these two great souls, Nammāḷvār and Matura Kavi, the latter himself one of the Āḻvārs. Nammāḷvār replied: “It will eat that and lie there." Matura Kavi realised that Nammāḷvār meant that though the body is a dead thing and soul infinitely small, it had the capacity to stay in the body and live on it. By this Nammāḷvār sought also to convey that emancipated souls, though finite and small, dwell in God and God is their food, wealth, mind, wisdom, bliss and everything. He himself has spoken of service of God as the greatest gift of God, exceeding even the matter of liberation from the cycle of births. The teachings of Nammāḷvār are said to be capable of liberating anyone. His influence on the course of religious history was enormous. The place of Nammāḷvār in Śrī Vaiṣṇavism can be gauged from the fact that he is held to be the most important among the Āḻvārs. When one considers that he was of the fourth varṇa, one can under­stand the height to which a person can rise by the love of God. His very name, Nammāḷvār, meaning “Our” Āḻvār, shows the esteem and affection in which he is held in the Śrī Vaiṣṇava community. He is also known as Caṭakōpaṉ, which is a symbol representing the Lord's feet are placed on the devotee's head in reverential worship. "By becoming servants of the Lord, we have verily become, as it were, His sacred sandals" (Tiruvantati- 31). Besides Tiruvāymoḷi his other works are: Tiruviruttam, Tiruvāciriyam and Periya Tiruvantati.